WELLINGTON (Reuters) - The world's biggest dairy exporter, New Zealand's Fonterra, has found itself caught in the crossfire of an unexpected new controversy: a global environmental campaign against the destruction of rainforests. The South Pacific island nation, which prides itself on its green image, has become a top buyer of palm kernel expeller or PKE, a by-product of the palm oil industry, which is under attack over deforestation, choking fires and habitat destruction in Southeast Asia. For New Zealand dairy farmers palm kernel has been a "lifesaver" by boosting production when grass is sparse, said Chris Engel, who runs 400 cows in the Wairarapa region on the southern tip of the North Island. "It has been a fantastic supplement for farmers facing a drought and you can just ring up and get a truck load when you need it," he said. But environmentalists say the product - what's left of the palm kernel once the oil has been extracted - contributes to the profitability of the palm industry and have called on Fonterra to stop using PKE linked to environmental damage. Unlike in Europe and North America, New Zealand dairy cows spend their lives outdoors, eating mostly grass. But imports of PKE, a dry, gritty meal with a soapy smell, have risen 10-fold over the past decade as farming has become more intensified and the use of supplementary feed has surged to ramp up production. "A third of all PKE that's traded in the world goes to New Zealand," said Russel Norman, executive director at Greenpeace New Zealand. "New Zealand is spending over NZ$400 million ($270 million) a year on PKE and so it's a significant profit center for the palm industry." Recently Fonterra called on its 10,500 farmer shareholders to limit the use of palm kernel to 3 kg per animal per day. 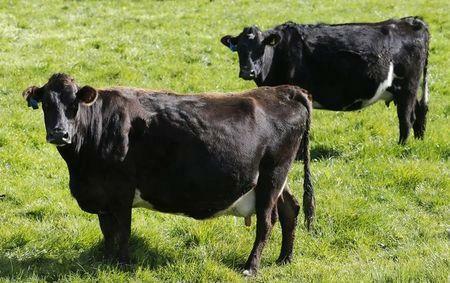 Farmers say cows can need up to 6kg of the supplementary feed per day when conditions are dry. Fonterra said the suggested limit was not linked to international pressure to stop the use of palm products but rather a bid to protect a premium commanded by products from grass-fed animals. "Consumers love New Zealand dairy products and we want to increase that value by ensuring our New Zealand milk comes from predominantly grass-fed cows," Miles Hurrell, managing director of co-operative affairs, said in a statement in September. Fonterra declined to comment to Reuters on the use of PKEs. However, the company, which was rocked by a botulism scare in 2013 which later proved unfounded, has also voiced concern about tropical deforestation and carbon emissions associated with palm oil plantations. It says its supplier, Wilmar International, has a "no deforestation, no exploitation" policy. Wilmar told Reuters the New Zealand PKE business made up less one 1 percent of group revenues. But this year's El Nino weather pattern could drive up palm kernel use if pastures are significantly affected by drought, said Andrew Hoggard, dairy industry group chairman for industry lobby group Federated Farmers. "If you don't have grass, you still have to feed the cows something," he said. Dry weather is already affecting some key dairy areas and weather patterns associated with the current strong El Nino look set to continue into 2016. Dairy represents around 25 percent of New Zealand exports but weak international prices mean the central bank now estimates around 80 percent of dairy farmers will have negative cash flow in the current season, posing a risk to the economy. Weak dairy prices, however, may help the bid to curb the use of palm kernel. Agricultural consultants AgriHQ said imports are down 4 percent in the year to October. "Buying in supplementary feed has been a last resort for many" due to the low dairy prices, it said. The number of cows has also been reduced, partly due to the weak returns in the sector. According to Statistics New Zealand there were 6.4 million dairy cattle in New Zealand in the year to June 2015, 300,000 fewer than in 2014. "We expect some increases in PKE demand over summer, however, not to the level you would normally expect to see with these weather conditions," said AgriHQ.